The 2006 Corruption Perceptions Index (CPI), launched earlier this week by Transparency International (TI), points to a strong correlation between corruption and poverty, with a concentration of impoverished states at the bottom of the ranking. Bangladesh has made a numerical progress in containing corruption as the Corruption Perception Index of Transparency International placed the country third, after its topping the list of the corrupt for five consecutive years. Bangladesh, along with last year's co-holder of the title of "most corrupt nation, Chad, secured the third position with a 2.0 score. This time, the Democratic Republic of Congo and Sudan are also classed with Bangladesh and Chad. "Corruption traps millions in poverty," said Transparency International Chair Huguette Labelle. "Despite a decade of progress in establishing anti-corruption laws and regulations, today's results indicate that much remains to be done before we see meaningful improvements in the lives of the world's poorest citizens." A strong correlation between corruption and poverty is evident in the results of the CPI 2006. 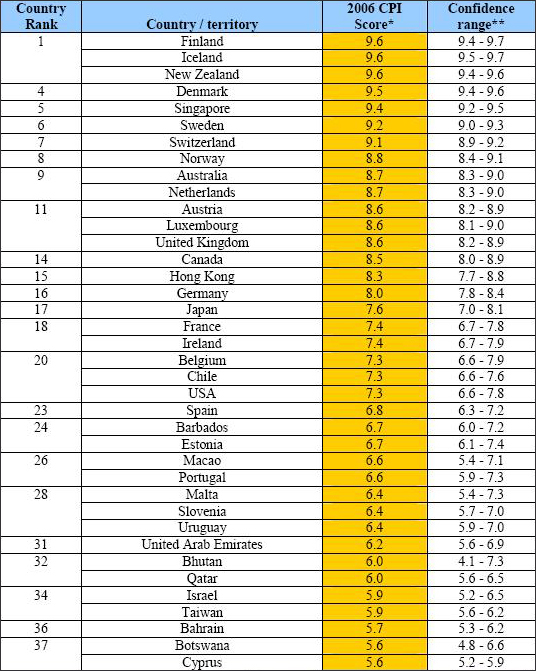 Almost three-quarters of the countries in the CPI score below five (including all low-income countries and all but two African states) indicating that most countries in the world face serious perceived levels of domestic corruption. Seventy-one countries -- nearly half -- score below three, indicating that corruption is perceived as rampant. Haiti has the lowest score at 1.8; Guinea, Iraq and Myanmar share the penultimate slot, each with a score of 1.9. Finland, Iceland and New Zealand share the top score of 9.6. Political graffiti highlighting the corruption of a political adviser, who was caught at the airport with $100,000 in his underpants. Haiti replaced Bangladesh this time getting 1.8 score out of 10 where Guinea, Iraq and Myanmar got 1.9 score. The Berlin-based anti-corruption watchdog agency, TI, today released the CPI report simultaneously across the world. Countries with a significant worsening in perceived levels of corruption include: Brazil, Cuba, Israel, Jordan, Laos, Seychelles, Trinidad and Tobago, Tunisia and the United States. Countries with a significant improvement in perceived levels of corruption include: Algeria, Czech Republic, India, Japan, Latvia, Lebanon, Mauritius, Paraguay, Slovenia, Turkey, Turkmenistan and Uruguay. A concentration of so-called "failed states" is apparent at the bottom of the ranking. Iraq has sunk to second-to-last place, with pre-war survey data no longer included in this year's CPI. Intermediaries who began operating during the United Nations Oil-for-food program continue to play a central role in driving corruption. The Volcker Commission reported that 2,392 companies paid kickbacks or made other illicit payments to the Saddam Hussein regime in the context of the program, often through intermediaries. While the industrialized countries score relatively high on the CPI 2006, we continue to see major corruption scandals in many of these countries. Although corruption in this context may have less of an impact on poverty and development than in developing countries, these scandals demonstrate that there is no room for complacency. Transparency International Bangladesh (TIB) Board of Trustees Chairman Professor Muzaffer Ahmad formally launched the report on behalf of the TI. According to TI, the fact that Bangladesh no longer occupies last place in the table is attributable more to the poor performance of several other countries than to a drop in corruption levels in Bangladesh as such. "In fact, among Asian countries Bangladesh has been mentioned together with Myanmar and Cambodia where the lack of political will to strengthen anti-corruption institutions has perpetuated rampant corruption, undermining improvements in quality of life for the poorest citizen," the TIB press release quoted TI as stating. In this year's index, five countries have been dropped while nine new entered--the total number of countries standing at 163. In 2001, the number was 91, in 2002, 2003, 2004 and 2005 the number was 102, 133, 145 and 158 respectively. Replying to queries Muzaffer Ahmad said there is no reason that Bangladesh position would be improved if new countries included in the index. "There is guarantee of this," he said, underscoring the need for carrying on a combat against the menacing crime. Pointing the way to get rid of corruption he said if the government reduced poverty, income disparity and created a level playing field for all, the moral rot would be reduced significantly. The TI prepared the composite index through a poll of polls- using corruption-related data from a number of expert surveys involving business leaders and analysts.